Before planning a remodel, understand all of the details – including the timeframe, the budget, the design process and how you’ll manage without a kitchen while work is being completed. This kitchen was recently completed by the team at McDowell Remodeling, in St. Charles. It’s easy to feel overwhelmed when undertaking a home remodeling project. You face a slew of questions and decisions, not the least of which include budget, timeline and style. Our region’s home remodeling and design/build experts have been through this process plenty of times, and they know how to start a remodeling project the right way. Here, they offer insights into the most frequently asked questions they hear. Timeframe depends largely on the scope and scale of the work being done. A kitchen remodel, for example, may extend a month or two – just in the design phase. From demolition to final inspection may last eight weeks or more. Being without a kitchen for several weeks can be challenging, so firms like Insignia often provide makeshift cooking areas that homeowners can use throughout the project. McDowell Remodeling, in St. Charles, sets up makeshift kitchens and loans out small refrigerators and microwaves. Set aside about two weeks from the time your cabinets are installed until the countertops arrive. Boznos typically sees blank stares when she starts talking budget, so she offers a rule of thumb for estimating overall cost. “Typically, you’ll want to spend 20 to 25 percent of the value of your home on the kitchen,” she says. “That means you’re not undervaluing your home, but that also means you’re not overspending on your home.” Bathroom remodels, she says, usually fall between 10 and 15 percent of a home’s value. Your ultimate cost varies with the types of materials you choose. Early in the process, Insignia’s designers break down costs into good, better and best options, so homeowners can stay focused on their budget. Their worksheet covers details from cabinets and flooring to towel bars and faucets. “We can remind them that they want to be in the middle column, the better options, but what they’re selecting now is exceeding what we allocated for this area,” says Boznos. Sue McDowell, who owns McDowell Remodeling with her husband, Bob, meets clients who think they’ve done their homework and know their budget – but it turns out they’re often missing critical information. What’s my potential return on investment? Remodeling Magazine releases an annual “Cost vs. Value” report comparing common home improvements. In its latest report on states in the upper Great Lakes, an upscale kitchen remodel here can return an estimated 60 percent. By comparison, bathroom projects and master suite additions fetch just less than 50 percent. The average kitchen can last about 15 to 20 years before it looks dated, designers say. So, if you’re looking to sell within the next five to 10 years, keep in mind what might appeal to a future homebuyer. 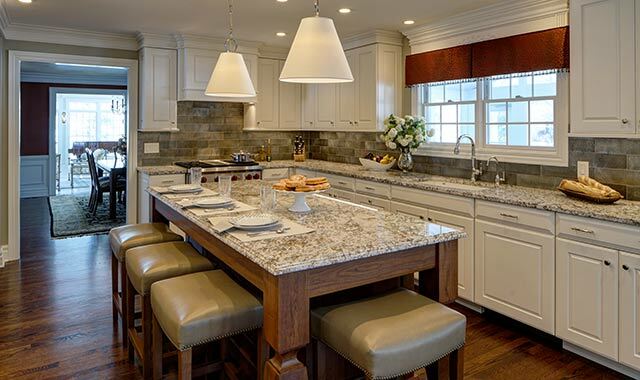 Kitchens, like this one by Insignia Kitchen & Bath, in Barrington, provide a big selling point for potential homebuyers. Designers Jennifer Boznos and Sheryl Wardlow warn against creating a showroom kitchen solely for buyers. You never know what they may change. Will this choice help to sell my home? Homeowners often fret whether a certain material will attract a future homebuyer. The answer depends upon the current homeowner’s long-term plans. If you’re looking to sell in the next few years, keep your updates modest, says McDowell. There’s no telling what a future buyer may think. Before Boznos begins a project, she asks a client to rank, in importance, functionality, cost and timeframe. Knowing these priorities helps Boznos to maintain focus. “If they’re telling me they want to sell this home, and they’re remodeling because they want to sell and get the biggest bang for their buck, I’m going to start directing them to products that will be a big selling point in the home,” Boznos says. Whether you’re into ultra-contemporary, French chateau or something in between, chances are you’ll be able to find what you’re looking for. As she’s beginning a project, Wardlow enjoys touring a client’s home. It helps her to grasp the family’s personal tastes and identify a complementing style. 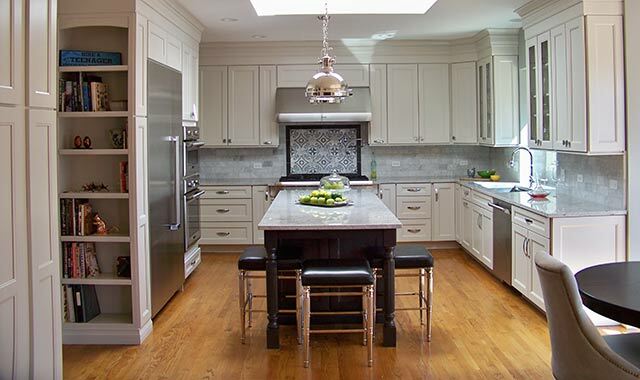 Houzz is also a good resource for finding kitchen designers in your area. Both Insignia and McDowell Remodeling are searchable by ZIP code, and both firms share photos of their recent work. Countertop styles come in many choices, and the possibilities are almost endless. Hammerl narrows the possibilities by asking a few questions. What are the latest technologies to know? The Insignia showroom is filled with examples of new technologies that limit wiring and maximize space. In many a modern kitchen, outlets and appliances are being tucked away, out of sight. Inside one model bathroom, there’s an overhead fan that plays music through a Bluetooth-connected device. Open a cabinet door and you’ll see a convenient place to charge your iPad or plug in your hair dryer. An outlet is wired right into the side of the cabinet or drawer. A new setup, the galley kitchen sink, combines numerous functions. Deep enough for washing dishes and often located in a kitchen island, the galley sink comes with functionality galore. Digital displays are everywhere in the modern home. Mikelsons is working on a project right now that incorporates high-tech Lutron switches. Do you have any low-maintenance materials? Homeowners are flocking toward kitchen surfaces and fixtures that require a minimum of upkeep. That may explain why quartz is replacing granite as the most-chosen countertop surface. A manmade composite material, quartz is durable and comes in a wide variety of colors, styles and price points. Unlike some granites it requires no sealing, and it’s a suitable alternative to marble, which is showing up frequently in all-white, contemporary kitchens. I saw something on HGTV and it cost this much. Why do you cost more? McDowell hears, from time to time, that a client is shocked by the cost difference between a televised house flip and a real-life remodel. “They say, ‘I thought I was educated, I really did my homework,’” says McDowell. Where’s the discrepancy? First, keep in mind that this is the Chicago area, one of the largest markets in the U.S. Costs related to home prices, building materials, permitting fees, varying building codes and labor are different in other states. Why do I need a kitchen designer? Can’t I do it myself? The DIY kitchen takes a good amount of coordination and expertise. Homeowners who endeavor to hire a handyman or play contractor themselves should be ready to juggle every small detail. A designer, on the other hand, is backed by a team of qualified experts. Homeowners still have a lot of decisions ahead of them, but there’s lots of help. Clients who work with McDowell Remodeling coordinate with a single designer from start to finish. As a design/build firm, McDowell coordinates architectural drawings, contracting and design. When selecting materials like cabinets and flooring, a McDowell designer goes shopping with the homeowner. Insignia’s in-house project manager reviews every order and coordinates with contractors. The company prides itself on a process of thorough double-checks. “Mistakes can cost time, so we like to do our due diligence in ensuring we order material correctly the first time,” Boznos says. There’s also value in working with a firm that’s been at the trade for decades. Hammerl founded his business in 1995 and prides himself on providing knowledge, experience and quality customer service. This entry was posted on Tuesday, May 2nd, 2017 at 11:58 am	and is filed under Home & Garden. You can follow any responses to this entry through the RSS 2.0 feed. Both comments and pings are currently closed.